The EPA is considering expanding the use of two more synthetic chemicals that are devastating to pollinators responsible for the cultivation of our nation’s crops. The proposed additional use of thiamethoxam and sulfoxaflor only makes it harder for bee colonies and other beneficial insect colonies already distressed by glyphosate and neonicotinoids made largely by Dow Chemical, Bayer and Monsanto. The European Union is banning these toxic chemicals while US government agencies, including the Environmental Protection Agency – which subsequently ought to be stripped of that title – considers allowing more of them. 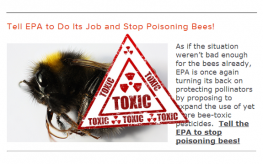 Pollinators cannot take any more environmental degradation caused by these noxious toxins. It boils down to this – do we want Monsanto or Monarchs, Bayer or Bees? Over 90% of GMO corn seeds are coated with bee-killing pesticides, and Monsanto has created enough glyphosate and neonicotinoid mayhem that entire colonies of Monarch’s have been killed in America. Yet, the companies that rule the planet right now are still in charge. Still ruining the environment, killing nature, and killing us with their bio-poisons. Croplife America, the main trade group for the US agrichemical industry has members which include Monsanto, Dow, Bayer, and Syngenta. These are the companies determining if you will ever see another bee pollinate the thousands of crops that we rely on as food staples in America. These are the companies petitioning to now use thiamethoxam and sulfoxaflor. Thiamethoxan was banned in France since it causes the death of honey bees. thiamethoxam is a neonicotinoid manufactured by Syngenta, meant to be used on GMO canola seeds. You could call their product the seeds of Satan, and it wouldn’t be a stretch. First, these seeds are meant to be coated with the chemical, and then when the seed germinates, the plant that grows from it takes the chemical up through its vascular system and expresses it through pollen, nectar, and guttation droplets from which bees forage and drink. In short, it kills them, but of course Swiss chemical giant Syngenta took the EU to court over the ban, caring little about our pollinators and overall environmental health. Russia is right to call these companies and the people who run them terrorists. These companies will stop at nothing to bait and switch the public and mislead governments into approving more chemical toxins for use on our crops. Furthermore, mainstream media tends to purposefully divert public opinion from the real cause of the destruction of bee colonies. These biotech conglomerates (which produce and market GMO seeds) have used the following misleading arguments to minimize the dangers of pesticide use: they blame Varroa mites, parasites, cell phones, and terminator seeds. No mention, at all, of millions upon millions of pounds of toxic chemicals in the environment. Reuters just reported on a new study proving pesticide use is ramping up due to the failure of GMO seed. “U.S. farmers are using more hazardous pesticides to fight weeds and insects due largely to heavy adoption of genetically modified crop technologies that are sparking a rise of “superweeds” and hard-to-kill insects, according to a newly released study.” According to Charles Benbrook, a research professor at the Center for Sustaining Agriculture and Natural Resources at Washington State University says that by 2011 we were up to 404 million pounds, and we know that number is rising annually. When there is a murder investigation, don’t authorities usually look at a smoking gun? There is mass murder of the natural world, and the weapon is made by biotech. You help put out the fire, here.